Sakai Community DocumentationSakai 11 - EnglishSakai 11 Administrator Guide Email TemplatesWhat is the Email Templates tool? The Email Templates tool is an administrative tool for providing localized and internationalized email templates for Sakai Applications. It allows admin users to create customized email notifications for users in their local instance. For example, if your institution has modified the name of Sakai to a different local system name (i.e. CTools, T-Square, etc.) you may modify the existing email templates to use your local system name and inform users about institution-specific resources. 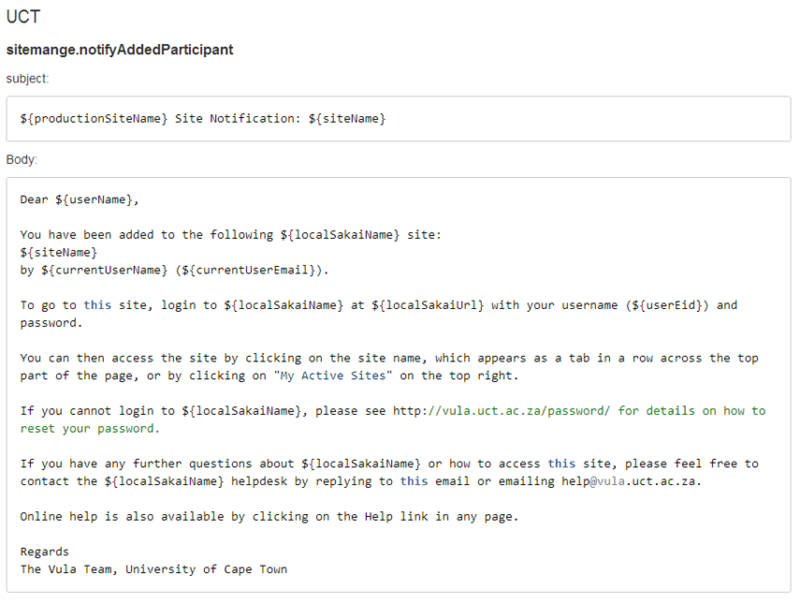 View existing template keys and locales. Zoom: View existing template keys and locales. A listing of all existing template keys and locales will be displayed. The template key is typically defined by the tools that have email templates in the system. You may see multiple template keys for different locales. The locale of a template typically refers to the language, or language+region, of the message. It may also refer to a custom local instance. Prev: How do I set a shopping period? Next: How do I edit an email template?